NK and nukes: back to the (dolsot curling) stone age? As expected, North Korea set the agenda ahead of the 2012 Seoul Nuclear Security Summit (see focus on Seoul Village), this time by announcing for April a 'satellite' launch in the general direction of (Japan, thank Kim The Third for small mercies) the East China Sea. Shooting Southwards doesn't make sense if you want to optimize a satellite launch and leverage the Earth's rotation, or in the case of North Korea, if you want to minimize the risks of casualties, but of course, that's not the aim of the game. And speaking of games: sweeping such a big fat "dolsot" curling stone all the way down to the hottest spot of contention between Korea and Japan*... my oh my, what a smart way of piggybacking international conflicts! You know, like a M-VNO entering a market without rolling out its own wireless network? These guys are inventing low cost dictatorship! With so much at stake, we have no choice but to try and be cautiously optimistic. And to keep humor alive. As Woody Allen put it during his intensive training of Kim Jong-un: "More than any time in history mankind faces a crossroads. One path leads to despair and utter hopelessness, the other to total extinction. Let us pray that we have the wisdom to choose correctly". In these really tricky times, I'm looking forward to Obama's visit of the DMZ, a potential 'jeoneun Hanguk saram imnida' / 'Mr Kim, tear down that wall' moment. Not a game changer, but a simple message: the time of reconciliation will eventually come, and the sooner the better, but it takes a dialog between both Korean halves, starting right now. Last year, South Korea was reconsidering its own tough-cop approach, which proved rather counter-productive... except maybe from the Chinese point of view (see "Re-engaging North Korea - A Four Party Talk"). Today, our panelists were more interested in how far the North was ready to engage in collaboration. Hosted by GCS International, this Asia Institute Seminar focused on "Revisiting Nuclear Safety and Nuclear Security in North Korea"***. Hard to expect full collaboration and transparency from the most secretive country on the touchiest of materials, with a nuclear industry globally in damage control mode ever since the tsunami hit the fan in Fukushima, and days after South Korea unveiled an embarrassing cover-up following an incident in its own nuclear facilities (see "Twelve Minutes in Bballi-Bballiland"). And Sharon SQUASSONI, an expert in proliferation prevention who's visited the North several times, thinks that North Koreans themselves may be a bit too confident about how much they know about their own level of security. You'd think the collaboration between Japan and its neighbors would have improved after last year's fiasco but it turns out that no, little or no progress has been made, and communication is already poor within an archipelago technically cut in two (electricity itself cannot circulate between West - 60 Hz - and East - 50 Hz! ), and where private operators are not compelled to disclose key indicators as is the case in the US. If even close and friendly neighbors don't trust each other, no wonder the general public show doubt and defiance toward governments and the nuclear industry in general. 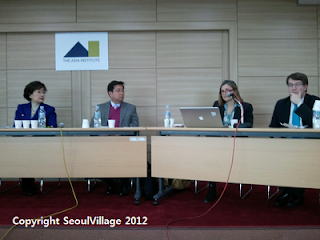 Former Minister of the Environment KIM Myung-ja stressed the power of activists and the need for transparency. After the Daichi mess, daily measurements of radioactivity from the Korea Institute of Nuclear Safety brought much needed clarity to the debate and today, I welcomed the precious insights from their principal researcher: a technical expert with a sound approach of the human and cultural factors, Dr KIM Sok-chul underlined the differences between security and safety, or between the perception of events, their comprehension, and their prevention. He also revealed that the risk of human errors was maximal with knowledge based behaviors (compared to ruled based or skilled based systems). The same could be said about finance and neural scoring systems but enough scary stories for today. Actually, this very gloomy period could prove rich in opportunities. Instead of the usual blame game and finger pointing at one rogue state, both Koreas, China, and Japan could humbly seat at the same table with a simple task: we're all in this together, as neighbors and fellow (at least) civil nuclear powers, and we are all facing criticisms for various reasons. Let's share about it, and find ways to be more efficient for the next emergency. To make it simpler, let's keep Russia and the US out of this***. We won't judge each other, just make sure we handle things better than last year. Maybe, as trust and confidence grows, we'll share more information, but let's start this with modest yet vital objectives. Since the audience was rather small, everybody could chime in, so I suggested this sort of a NEAR (North East Asia Response) task force. Earlier, Scott SNYDER, who deplored the US failure to prevent vertical proliferation, had proposed a more direct offer to North Korea: you want to launch a satellite? Great: we can do it for you, and safely. Of course they'll refuse (it's all about controlling the propeller, and not for satellites), but bringing the discussions to new planes may work better than - say - Sergey Labrov's basic reset button. ** if you're a bit lost with the different characters, see the previous episodes of our NK drama, including "Re-engaging North Korea - A Four Party Talk"
**** anyway, as Dr KIM pointed out, 20 years from now, 50% of the world's nuclear reactors will be located in the region. "In these really tricky times, I'm looking forward to Obama's visit of the DMZ, a potential 'jeoneun Hanguk saram imnida' / 'Mr Kim, tear down that wall' moment." Thank you for this idea from the ex-president Ronald Reagan at the Berlin Wall. Yet, I'm looking forward to Obama style rhetoric at the DMZ, which he demonstrated in his address to Aipac — "NK nukes are not simply about S.Korea’s security, but about U.S. national security and global security. If NK attacks S.Korea, the US will consider it as an attack against the US."